Tom Hardy may play gruff, tough characters on-screen, but he’s also a kind soul, willing to muck in and do his bit for charitable causes. 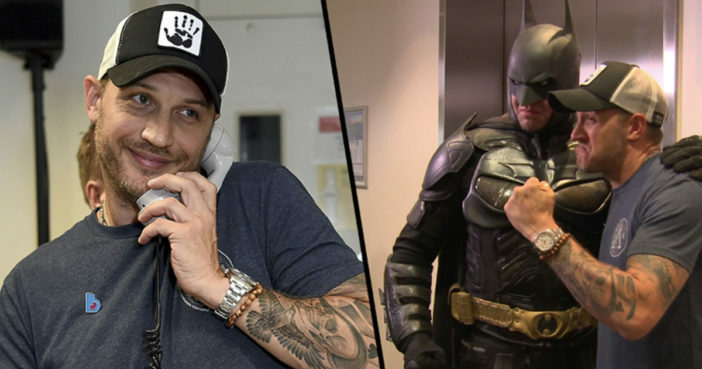 This year the Venom actor lent his richly textured voice to the 14th Annual BGC Charity Day in London; manning the phones with his signature brand of manliness. This charitable event remembers the BGC and Eurobrokers employees who passed away on 9/11, with the money raised supporting those who’ve been affected by terrorism, emergencies and natural disasters. Since the very first BGC Charity Day back in 2004, an astonishing $147million (£113million) has been raised across the world, with every penny given to the Cantor Fitzgerald Relief Fund and other charities. A total of 658 friends and colleagues of BGC died on September 11, 2001, along with 61 Eurobrokers employees. Each anniversary is a poignant occasion for us. Charity Day is our way of turning a tragic day into one that is positive and uplifting by helping others. Tom was photographed while busy on the phones alongside other celebs such as Olly Murs, Nicole Scherzinger, Jimmy Carr, Mel C and Bill Nighy. Despite the sadness of the occasion, the commitment shown to raising life-saving funds was inspiring to see. Fans particularly loved the sight of Hardy – looking much friendlier than Bane – posing next to a fully costumed Batman. This philanthropic act comes shortly after it was revealed Hardy is branching out into the world of grime music, teaming up with producer Sam Williams for a new album. Tom has always had a huge passion for rapping ever since he was a young boy. In the past he’s put song- writing on the backburner but just recently decided to pick things up again after building a friendship with producer Sam Williams. They’ve been busy working on a selection of songs together for an album and it’s really starting to get some steam. Tom’s a bit tentative about releasing it for the world but big labels including Warner have already shown an interest in picking it up, so there is real potential for it to hit the charts. A two-decade-old rap mixtape entitled, Falling On Your A***, was leaked online in early 2018, which Hardy had created under the moniker Tommy No 1. Hardy has previously written ‘loads’ of tracks, which have been left unreleased. However, now Hardy’s musical abilities look set to shine and fans couldn’t be more intrigued. Tom Hardy is planning to release a hip hop album and I couldn’t be happier. Gimme that UK Grime. Tom Hardy doing a grime album has literally just sent me under, cannot cope with this, need a lie down ? Truly a man of many talents. Is there anything Hardy can’t tip his hat to?